With the dual threat of freezing rain late this week now behind us (and with neither having materialized), it's time to turn our attention to the next weather threat - severe thunderstorms. With high pressure drifting by to our east today and tonight, the clockwise flow of air around it will mean southerly wind. The high will take up residence over the southeastern U.S. and western Atlantic for the next few days, resulting in a prolonged period of southerly wind and tapping into our biggest moisture source - the Gulf of Mexico. The result will be increasing temperatures and rising dewpoints (low level moisture) as we head into the end of the weekend and first part of the work week, as well as chances of scattered showers. 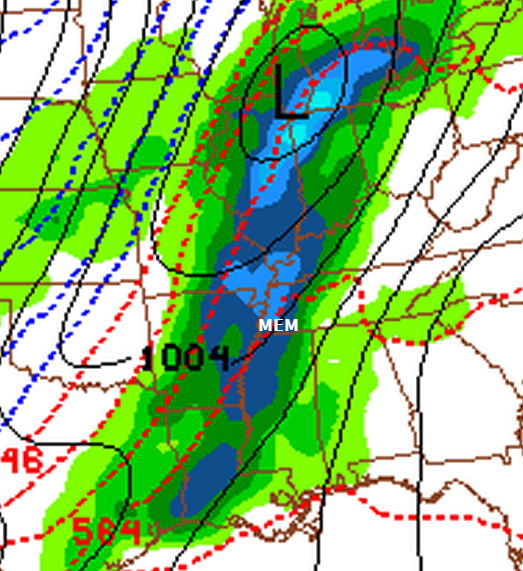 The next big weather-maker will organize during this time to our west and move into western portions of the Mid-South Tuesday, sweeping a cold front through the area Tuesday into Wednesday. So far, medium-range computer models have done poorly at handling the timing and other details of this approaching system, but are now beginning to come into some agreement. Below are the GFS and European models, both depicting their notion of the state of the atmosphere at midnight Tuesday night/Wednesday morning. While there are some differences, the timing is beginning to agree with the Tuesday night timeframe the most likely for the heaviest weather and possible severe thunderstorms. GFS computer model from overnight showing possibility of strong storms in the area early Wednesday morning . Map valid midnight Wednesday. 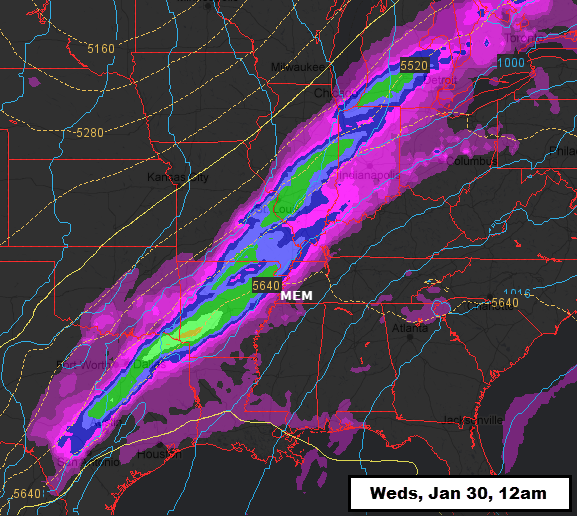 European (ECMWF) computer model from overnight also shows storms lining up just to our west at midnight on Wednesday. Temperatures on Tuesday ahead of the main batch of storms will likely be into the lower 70s with dewpoints above 60 - an indicator of strong thunderstorms. As typical for this time of year, the wind profiles (wind from the surface up tens of thousands of feet) will be more than sufficient to support strong storms. The question mark will lie in the amount of instability, or unstable rising air, that materializes. The Storm Prediction Center, the issuer of convective outlooks and watch boxes for the United States, has also noted the models recent agreement on the large-scale pattern and highlighted much of the region for a potential for severe weather on Tuesday (Day 4) and Wednesday (Day 5). 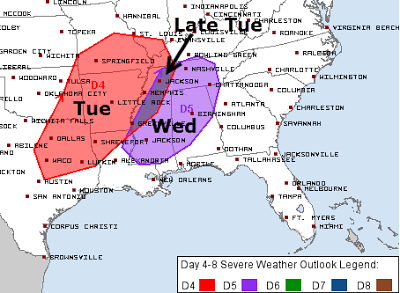 While there will be changes to this in the coming days, they indicate that the metro will be most likely to see possible severe weather late Tuesday into early Wednesday, just as the models above do. SPC graphic - highlighted areas have a 30% or higher risk of severe weather on the days indicated. With temperatures rising into the 60s and low 70s in late January, most Mid-Southerners understand that the potential for trouble may not be far behind. Stay in touch with us over the coming days and we'll keep you updated as the severe weather potential becomes more defined. 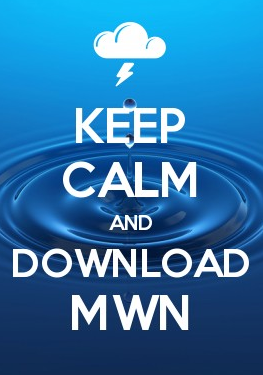 Now is also a great time to download the MemphisWeather.net mobile app for iPhone and Android, or if you already have it, be sure to take the last step and purchase the StormWatch+ premium upgrade, which will notify you of severe weather, but ONLY if your preset location(s) are in the path of the storm. This one-time upgrade will bring you peace of mind and has the potential to save a life, especially if severe weather strikes overnight. It can be set to wake you up if a dangerous storm is headed your way!